This Pumpkin Spice Pavlova Cake is stacked and stuffed with pumpkin whipped cream and topped with boozy raisins, pecans and sea salt. Sponsored by Davidson’s Safest Choice Eggs. This is the time of year where you find pumpkin mixed into everything. And why should I be any different?! I love all things pumpkin. 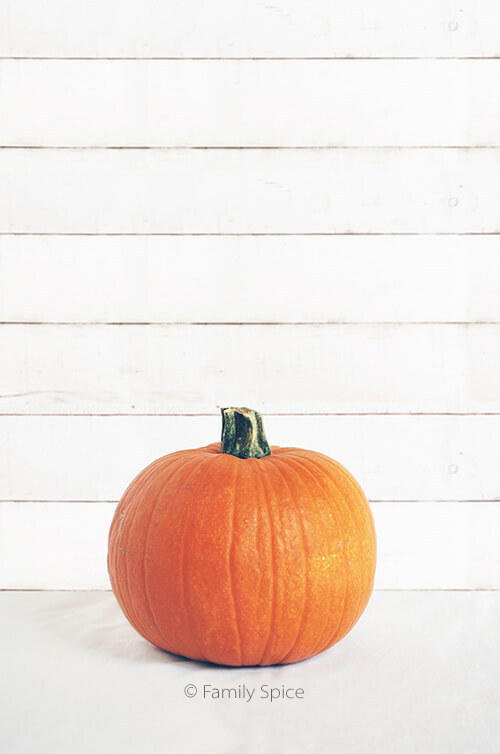 It’s Fall and why should pumpkins be reserved for decor alone? I prefer roasting my own pumpkin for purée compared to purchasing canned pumpkin. But, I can certainly appreciate the convenience of pre-made pumpkin purée. Cinderella and Sugar Pie Pumpkins are my first choice for roasted pumpkin. And what a surprise to find some pumpkin purée waiting for me in my freezer. But, what to do with it? I decided to reach out of my comfort zone for today’s recipe. Baking takes patience, a trait I am sorely lacking. I was never a super patient person. What patience I do have, is sucked away by my three kids. And husband. Oh yeah, dealing with their shenanigans definitely takes patience. So if a recipe requires my complete and total attention without distractions, then odds are, I’ll screw it up somehow. Making a pavlova is one of those baking adventures that requires calmness and patience. My first attempt at this recipe, didn’t quite turn out. My pavlova collapsed. I didn’t whip the egg whites enough and then it cooled too quickly after baking. Tsk, tsk. Patience, patience, Laura. I looked at my disastrous kitchen, sucked in a big breath and attempted it again. This time, more slowly and more diligently. Meringue is basically whipped egg whites and sugar. It is crunchy all the way through. A Pavlova, supposedly named after the Russian ballerina, Anna Pavlova, has the addition of corn starch and vinegar. This gives the dish the crunch of a meringue on the outside, but a softer inside. And mine were seasoned with pumpkin spices: cinnamon, cloves and nutmeg. To make this Pavlova cake, I whipped up some pumpkin whipped cream. Topped with raisins soaked in Grand Mariner, pecans and a dash of sea salt, and this baby was complete. This light and airy dessert is cushioned with fluffy pumpkin whipped cream for a real show-stopper dessert. Perfect for a fall dinner, Halloween party or even Thanksgiving dessert. To serve, cut into it like you would any other cake. Just be sure your knife is sharp or you will crush the meringue. Are you as pumpkin mad as I am?! 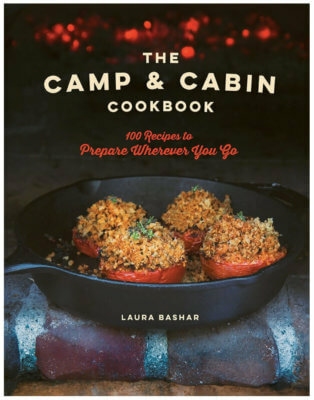 Check out this post on other ways to add pumpkin to the menu! Preheat oven to 275ºF and line 2 baking pans with parchment paper or silicone sheets. Beat at high speed until meringue is glossy and holds stiff peaks, about 5 minutes (longer if using handheld mixer). Spoon mixtures onto the prepared baking sheets and form 2 9-inch circles. Using a rubber spatula or palette knife, shape into circles as evenly as possible to resemble two traditional flour cakes. Run a spatular/knife up the sides of pavlovas, all the way around to keep the meringue structure sturdy. Bake meringues for 45 minutes. Then, turn oven off and cool meringues in the oven for one hour. Remove from oven and continue cooling meringues to room temperature, about one more hour. If you are not serving meringues right away, they need to be stored properly. Moisture in the air will soften the once crispy meringues. As soon as meringues have cooled completely, pack them into air-tight containers in a cool room. Be extremely careful when handling the very fragile meringues. You can prepare the pumpkin whipped cream in advance, store in the refrigerator and then assemble the pavlova cake later. The longer the whipped cream sits on the pavlova, the softer the meringue will be. So, do not assemble cake until right before serving. Gently transfer one pavlova to cake stand and spread half of pumpkin whipped cream evenly over it. Carefully place second pavlova over the whipped cream, and spread with remaining pumpkin whipped cream. Serving Suggestions: Serve alone or with seasonal fall fruits like figs, pears and apples. Drizzle a little melted caramel for even more decadence. Cooking Tips: To make this kid-friendly, soak the raisins in hot water instead of Grand Marnier. The Pavlova by itself has a terrific flavor with the pumpkin spices. Imagine the possibilities?! Laura, your photos are always gorgeous but this one? You have outdone yourself! Brava. Thank you, Stephanie! I really struggled taking these pictures, for some reason. I was terrified I’d break the fragile Pavlova and have to make it again! Laura, this is the perfect Fall dessert, and your photo is lovely! Thank you, darling. It did feel weird not having any olive oil in this recipe! LOL! Thank you so much for your sweet words, June! This is beautiful! Yummed and schedule to pin! Just gorgeous Laura! 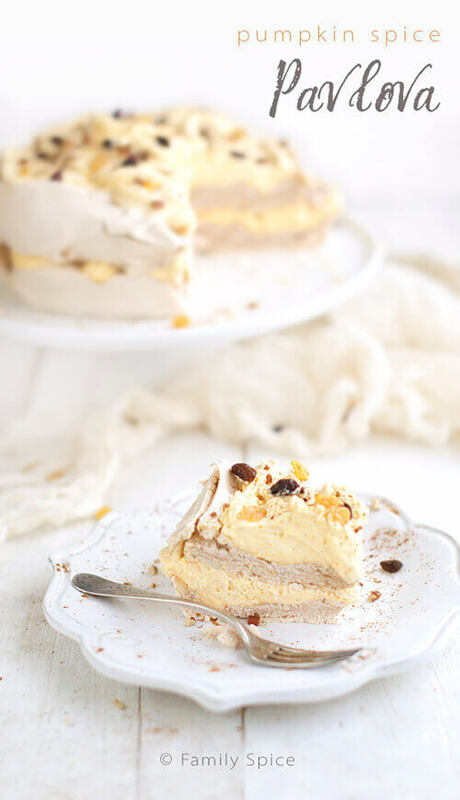 Pavlovas are such a fun dessert, and I’m sure the pumpkin spice element takes it to the next level! Wow! I love pavlovas, but have never thought to do anything this creative with them! It looks stunning and I’m sure tastes the same! Nice job! Oh my goodness, this is brilliant, WOW! I love this flavor combination and it looks perfect – gorgeous! Lovely, dreamy pavlova dessert and luv the pumpkin whipped cream! What a beautiful and elegant dessert. The spices have really dressed it up in the flavor department too! I’m in pumpkkin overload…but, that’s totally ok. I love it and this recipe sounds so good! Shut the door! This is my kind of dessert! 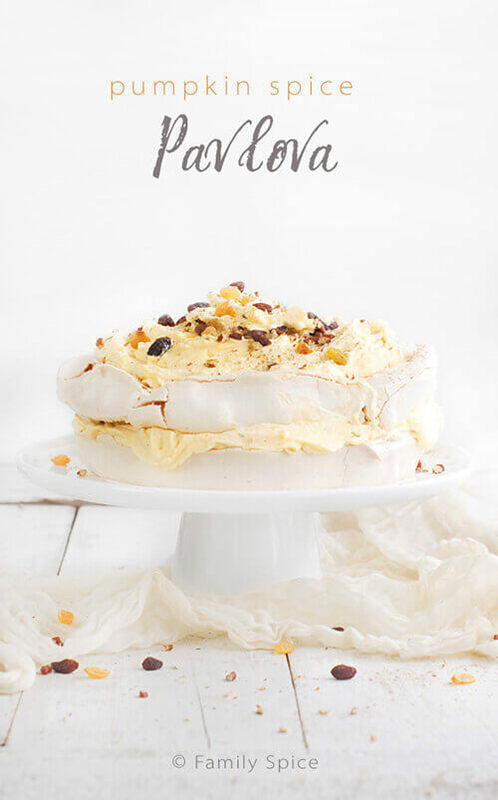 I love pavlova, but your pumpkin spice version takes it from summer to fall! Gorgeous!